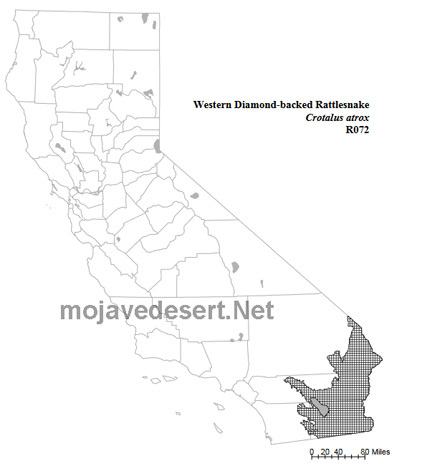 The western diamondback rattlesnake is widely distributed in the Colorado Desert of California up to 600 m (2000 ft) in elevation, and perhaps higher in a few isolated locations. In other parts of its range it reaches an elevation of 3000 m (10,000 ft). It occurs in a wide variety of desert habitats, both on flats and in foothills, and prefers brushy areas. It is often common in riparian habitats. In California this snake is not as common as in the eastern parts of its range. A frequently nocturnal species, the western diamondback can be active any month of the year when temperatures are mild to warm, but is most active in spring and summer (Stebbins 1954, Klauber 1972). Feeding: The prey are struck and envenomated. Death follows rapidly and the prey is consumed. This snake takes small- to medium-sized vertebrate prey, such as rabbits, rodents, birds and lizards (Gloyd 1940, Stebbins 1954). This snake is usually found in brushy habitats, where these prey items are most numerous. Cover: Heavy brush is the most commonly used cover, but other objects such as logs, rocks and debris are used. Rodent burrows are often used for refuge. Boulder piles and rock outcrops are occasionally frequented (Stebbins 1954, Klauber 1972). Reproduction: Young are born live and thus a quiet, protected place is required such as a rodent burrow. Water: Free water is probably not required. Pattern: This species is widely distributed in brushy lowlands where larger vertebrate prey (rabbits, rats, etc.) can be obtained. It occurs in smaller numbers at higher elevations, on drier flats and in sparser vegetation . Activity Patterns: When temperatures are mild this species can be active during the day, especially in the morning. When temperatures are higher it is more frequently encountered at dusk and at night. It can be active any month when temperatures are mild to warm, but spring and summer are the periods of greatest activity (Stebbins 1954, Klauber 1972). Seasonal Movements/Migration: In the eastern United States, rattlesnakes are known to migrate between hibernacula and spring-summer ranges. The western diamondback has not been observed to migrate, but it is a poorly known species, and migration may occur. Home Range: Nothing is known concernlng the home range of this species, but other rattlesnakes are known to move considerable distances. 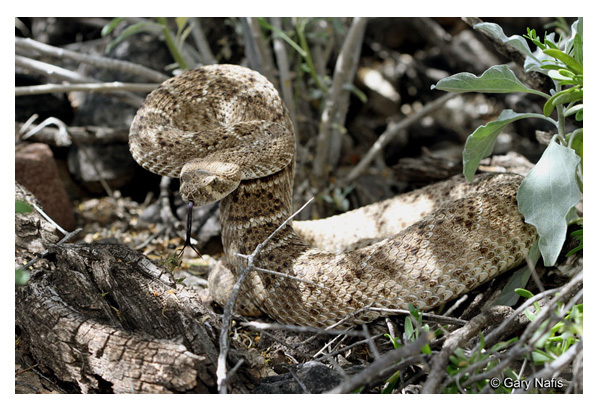 Reproduction: Western diamondbacks mate as early as late March and sometimes again in the fall. The young are born in late summer. They are born alive and broods range from 6 to 23 young, averaging 9 (Klauber 1972). Niche: This species is probably taken by roadrunners, eagles, other avian predators, and possibly by mammalian predators. Kingsnakes may take young diamondbacks. Droughts that reduce prey probably have a negative impact on this species. Ground squirrel eradication programs are probably deleterious because of the removal of prey and their burrow systems, which are used for reproduction and cover. General Comments: This snake is large, aggressive, has a complex venom and, therefore, is considered one of the most dangerous snakes in North America. Extreme caution should be exercised in handling this snake. Predominant potential natural communities includes the Creosote bush series, Creosote bush - white bursage series, Mixed salt bush series, Blue palo verde - ironwood - smoke tree series, Mesquite series, Ocotillo series and Foothill paloverde - saguaro series. Predominant potential natural communities includes the Creosote bush - white bursage series, Allscale series, Mixed salt bush series, Mesquite series, Ocotillo series and Fan palm series.